The results are in from the latest IoT Developer Survey and again this year, Linux is by far the most used operating system for Internet of Things devices. Surprised? You shouldn't be. Linux rules the roost in all areas of computing, so why should IoT be any different? The online survey is sponsored each year by the Eclipse IoT Working Group, AGILE IoT, IEEE, and the Open Mobile Alliance for the purpose of understanding how developers are building IoT solutions. The survey was open from January 24 until March 5, with 502 participants. 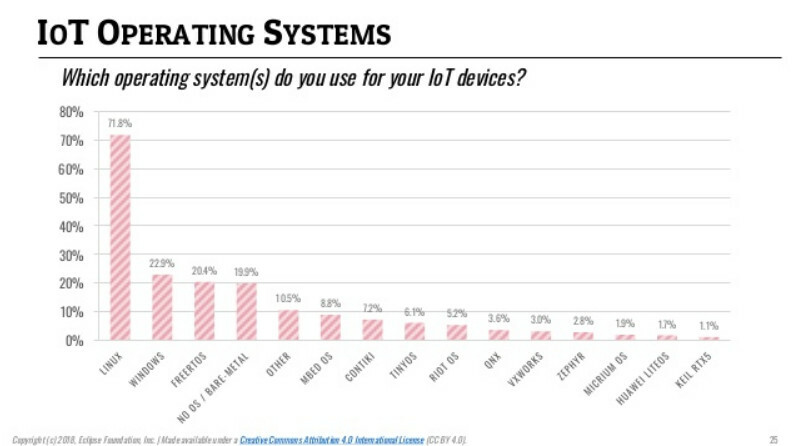 This year 71.8 percent of respondents ticked "Linux" to the choose-all-that-apply question, "What operating system(s) do you use for your IoT devices?" Windows came in second with 22.9 percent, followed by FreeRTOS with 20.4 percent. The answer "No OS/Bare-metal" took fourth place with a 19.9 percent tally. No other operating system received higher than a 10 percent vote. Despite Linux's commanding lead, it's slipped since last year's survey when it came in at 81.5 percent. However, that puts this year's number about on par with the 2016 IoT survey, when it made a 73.1 percent showing. Some of the current loss was undoubtedly due to FreeRTOS, a minimal operating system primarily designed for microcontrollers, which has risen 6 percentage points since the 2016 survey. In November, Amazon Web Services released its own version of the operating system, Amazon FreeRTOS, designed to be out-of-the-box ready for connected devices. FreeRTOS use will probably continue to rise as AWS works to build-out its infrastructure to accommodate its homegrown version of the OS. Linux is poised to take advantage of a similar situation. A couple of weeks ago Microsoft introduced Linux-based Azure Sphere OS. Like Amazon's version of FreeRTOS, Redmond's hand rolled Linux is also focused primarily on microcontrollers, and will be attractive to device makers because of it's ability to receive security patches and upgrades through the Azure Sphere Security Service. The results for Windows in this year's survey were mixed. Windows use showed an overall decline of nearly five percent since last year's 27.7 percent showing. However, it moved from third to second place due to a nearly 10 percent drop by "No OS/Bare-metal." Among the Linux distributions used in IoT, Raspbian tops the list at 43.3 percent, a decline of about two percent from last year, followed by Ubuntu at 40.2 percent, down nearly four percent from last year. Debian, which last year was a no-show, made a third place showing at 30.9 percent. 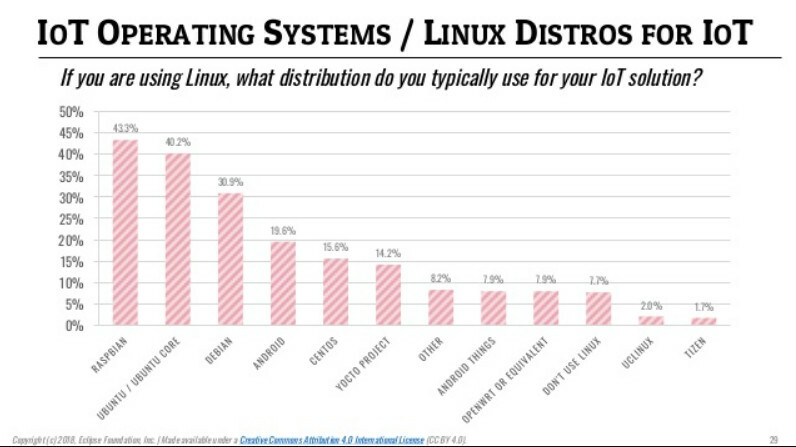 In addition to being the leading operating system for IoT devices, the survey indicates Linux is also the OS of choice for constrained and gateway IoT devices. Linux isn't the only open source software dominating IoT -- open source databases are also making substantial inroads. When asked about databases in another choose-all-that-apply question, 44.6 percent of respondents ticked MySQL, followed by MongoDB at 29.8 percent and the time series database, InfluxDB, at 15.7 percent. According to the survey, 93 percent of databases used in IoT are open source. The survey offered no surprises when it came to the public clouds that organizations are using to implement IoT solutions. Top dog AWS also rules IoT with a 51.8 percent showing, followed by Microsoft Azure at 31.2 percent, and private on-premesis clouds at 19.4 percent. As for the hardware architecture running IoT devices, at this point various versions of power sipping ARM pretty much run the show, although Intel x86_64 made a 31.8 percent showing for gateway devices. This is an area where we might see drastic change as soon as next year's survey. In April SiFive, the company behind the RISC-V open source processor that can be cheaply brought to market with highly specific designs, announced it had inked a deal with Western Digital, which is shifting its entire product line and plans on producing a billion RISC-V cores this year. Others are sure to follow. A complete rundown of the survey is available on SlideShare.